If it hasn’t happened to you yet, it will. A run will go south. People will be looking for you. Their eyes will be everywhere—your home, your friends’ houses, the places you hang out, even the spots where you buy your soykaf. They’re looking for you, waiting for you, and when they find you, they’re not going to talk. It’ll be a single shot, or a flash of sharp steel, and you’ll be done.To avoid this, you need to lay low. You need a place where no one will look for you, and where you’ll have enough of life’s basics to get you by. Don’t know where to find such a place? You’re in luck, chummer—we’ve got the guide for you. Whether your acquiring and stocking your own bolt hole or engaging professional safehouse managers, we’ve got the info you need to live to fight another day. 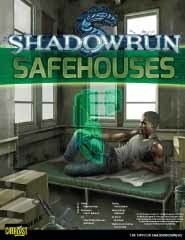 Safehouses is a supplement for Shadowrun, Twentieth Anniversary Edition that provides both flavor text and rules to help runners acquire or find the hideouts they need to stay out of harm’s way. It includes sample safehouses, equipment suggestions for the well-stocked hideaway, and safehouse creation rules that work with the Advanced Lifestyles rules from Runner’s Companion. Get Safehouses, stay safe, and be ready to charge back into the shadows once the trouble you’re in has blown over.